By having the ability to create your personalized products in house with the latest technology, we are able to offer an extremely quick turnaround time for you. 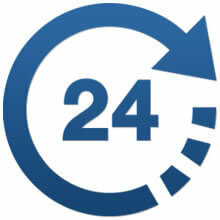 Most of our products have a 24-48 hour production time before the item ships. In the event that you need your notary supplies sooner, let us know. Not only do we work fast so you can get your order as soon as possible, we also offer different RUSH shipping options. Notary Supplies Online is a small but ambitious business who truly wants to help our customers find the right product for their jobs with as little hassle as possible. Along with a quality product, we also acknowledge how important it is to make sure that your product works well for you. This why we offer a warranty even on our personalized products.